Sonic the Comic #175 is the one-hundred and seventy-fifth issue of the Sonic the Comic series by Fleetway Editions Ltd.
Issue #175 marks the beginning of the "Coming of Chaos!" story, STC's adaptation of Sonic Adventure. 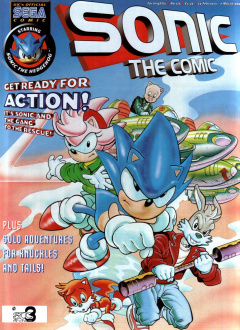 Fleetway's version of the Sonic Adventure plot is only very loosely connected to the official version from Sega, as the team was not supplied with adequate material for the game while the comic was in production. This is also the first story to be written by Nigel Kitching after his departure several issues ago. Across this issue and those which immediately followed, the characters slowly begin to resemble their Sonic Adventure counterparts, with Amy Rose adopting a different hairstyle, and perhaps more curiously, each of the characters gaining coloured pupils. 1.1 The Coming of Chaos! Somewhere in another dimension, Dr. Robotnik is sitting in his chair in a depressive state, with Grimer urging him to eat, promising the mad scientist that they will defeat Sonic next time. This only prompts Robotnik to demand that Grimer never mention's the hedgehog's name in his presence, which confuses Grimer on this sudden out-of-character move. Meanwhile at the Emerald Hill Zone, Sonic believes that the Freedom Fighters have finally defeated Robotnik, but Porker Lewis and the Kintobor Computer believe that Robotnik managed to avoid death and hid somewhere. Sonic tells them to quit worrying and celebrate the victory they have just earned. This is short-lived as the Kintobor Computer picks up a signal at Metropolis Zone showing a strange monster, to which all but Porker leave to answer the distress call. At Metropolis Zone, the Metropolis police try to ward off the monster with no success. Luckily, Sonic arrives to take care of the monster, but as he is about to attack it, he suddenly stops, unaware of what is holding him back. The same thing happens to Johnny Lightfoot and Tails, who also try to attack the monster. Feeling this strange effect too, Amy comes to the conclusion that this monster can affect people's minds, making them too fearful to attack it. Sonic then decides to charge at the beast, trying hard to ignore his fear and dashes inside its body. Bouncing back and forth inside the creature, Sonic is then thrown out while the creature, now a watery puddle, squirms away to a sewer. The Freedom Fighters check if Sonic is alright, and Sonic tells them that he is perfectly okay, despite the fact that his eyes have now turned green. This page was last edited on 18 March 2019, at 21:09.